Because Simon was among the first people to bring the Bloomsbury Group series of early-20th-century classics to my attention, I thought it was appropriate to make my first novella of the weekend one from that series: Henrietta’s War: News from the Home Front 1939—1942. by Joyce Dennys. The book is an epistolary novel (drool!) composed of letters from the titular Henrietta, a doctor’s wife in a Devonshire village, to her childhood friend Robert, who has gone off to war. These letters, along with Dennys’s illustrations, which also appear in the book, were first published as a regular feature in Sketch magazine during the war. When the war started, practically everybody, in the most laudable way, rushed off and began doing the thing they hated most. Faith forced her way into the Cottage Hospital, and stayed there for nearly a fortnight, doing ward-maid’s work; Mrs Savernack bought a book called Brush Up Your French; and Lady B, not to be outdone, bought a book called Brush Up Your German, which some people thought rather unpatriotic. Practically everybody who owned a car began driving somebody else’s and Colonel Simpkins, as a protest against ‘all this tomfoolery’, took lessons in ballroom dancing. But perhaps the most exquisite moment of all is when you sink back on your pillows and listen to everybody else getting up. It is madness to spoil this enchanted hour by getting up yourself to brush your teeth. You must lie where you are, relaxed, happy, and dirty, calling weakly for your letters, the morning papers, and another hot-water bottle. It isn’t that we aren’t sorry for them, for indeed, indeed we are. The first three Bomb Stories I heard moved me nearly to tears, and I lay awake all night planning how we could help them to forget. But one Bomb Story is very like another, and after a time one comes to the end of one’s exclamations of horror, and the attention begins to wander. And when we try to tell them our Bomb Stories, they say, ‘Pshaw!’ ‘Pshaw!’ they say, with superior smiles, and make no attempt to listen. See what she’s doing there? She’s giving us a chuckle while showing how we deal with pain and terror. We become inured to it, or we make one terror real and the other a figment. So there’s a real-life point. And that brings me to the final thing that impressed me about this book. Dennys doesn’t just tell silly stories. There are a few surprising moments where the people look out for each other or celebrate together in touching ways. A favorite of mine was when Mrs Savernack, tears in her eyes, brings a package of horse meat to Henrietta for her little dog Perry. I’m prickly when it comes to this kind of thing, and it doesn’t take much for sentimentality to cross over into soppiness in my mind, but Dennys stays on the right side of the line here. It’s a fun little book, and at only 158 pages, it’s well worth a couple of hours of your time. I’m so glad you enjoyed this! I agree, the way she balances comedy with really painful moments is what makes it work so well. Yes, all comedy or pathos would not have been nearly as successful. Lovely! A fine choice, and of course you lked it how could you not? Sometimes my inner curmudgeon resists books like this, but Henrietta totally won me over! I’m a sucker for the epistolary form, hence writing my review as a letter. I must read Henrietta Sees it Through. Slightly unrelated – glad to hear someone is appreciating Tenant of Wildfell Hall, it’s such a fantastic and underrated book! I’m so glad I finally read it. Jenny and I should have a joint review out in a few weeks. I’m a huge fan of epistolary novels, too! So glad you enjoyed this… it’s been on my wish list for too long. It’s been sitting on my shelf for a good long time. I’m glad I finally got to it. The humor sounds lovely, although this isn’t my cuppa. Oh, I love a Day in Bed (although in my case it’s usually a Day on Sofa). A lazy day now and then sets me up for productivity for weeks. *sigh* My aunt bought the whole first lot of Bloomsbury Group books for my mother at Christmas, and then decided she’d save two of them to give my mum for her birthday. She saved Henrietta’s War, which was the one I wanted to read the most, and then before my mum’s birthday happened, my aunt lost the book. I don’t know when I’m going to be able to read it but it sounds really lovely. I like to declare a Pajama Day every once in a while. Maybe I’ll do this tomorrow. 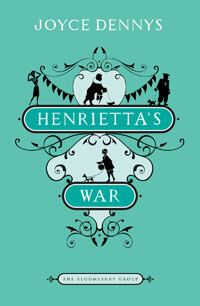 Wish I had Henrietta’s War to make it perfect. I was having something close to a pajama day when I read this, and it was ideal! This sounds really good. And an epistolary novel — excellent!